The first LED sources emitted infrared radiation, and it took many years of research before it was possible to create a semiconductor junction emitting visible light. At first it was only possible to generate red light, using Gallium Arsenide or Gallium Arsenide Phosphide. Yellow sources followed next. 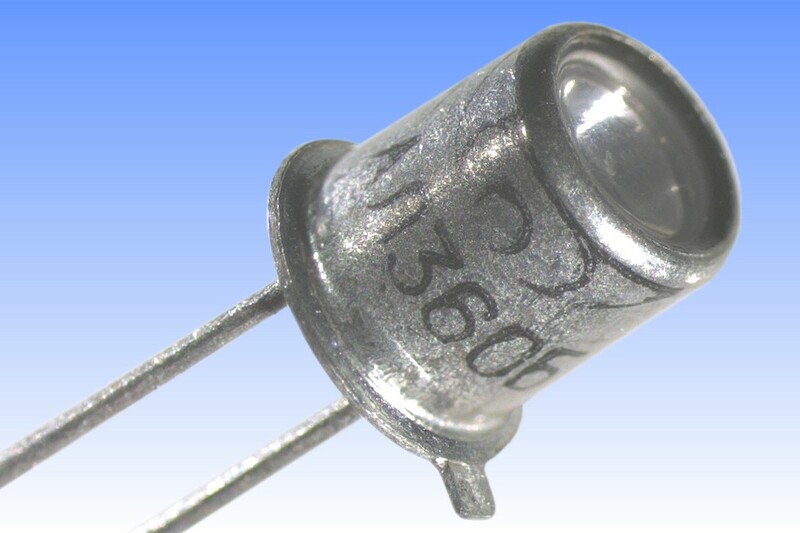 Based on silicon carbide, their output was pitifully low. Shorter wavelengths proved especially difficult to achieve, and after years of failure scientists switched to another approach employing the use of so-called Anti-Stokes phosphors. These are combined with a high power silicon-doped gallium arsenide infrared-emitting diode, whose radiation is up-converted to visible wavelengths by a coating of the phosphor directly on the surface of the die. 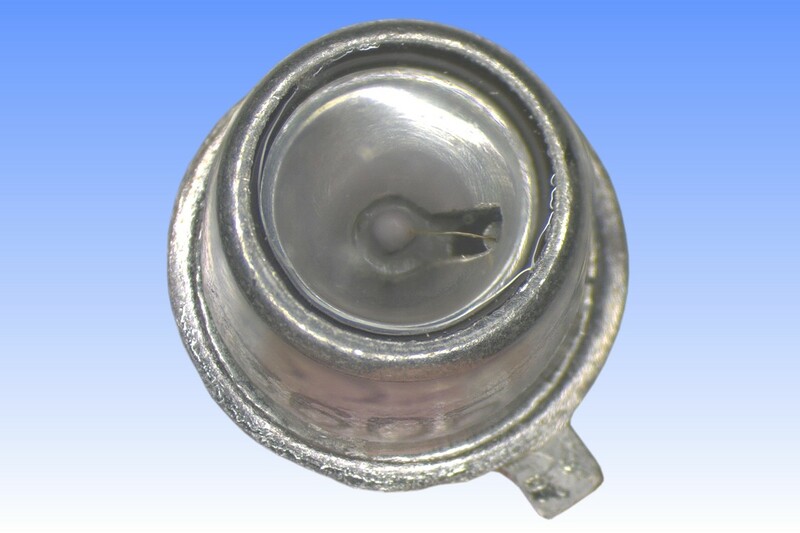 The first commercial Anti-Stokes LED is believed to have been the SSL-3, introduced by General Electric around 1968. 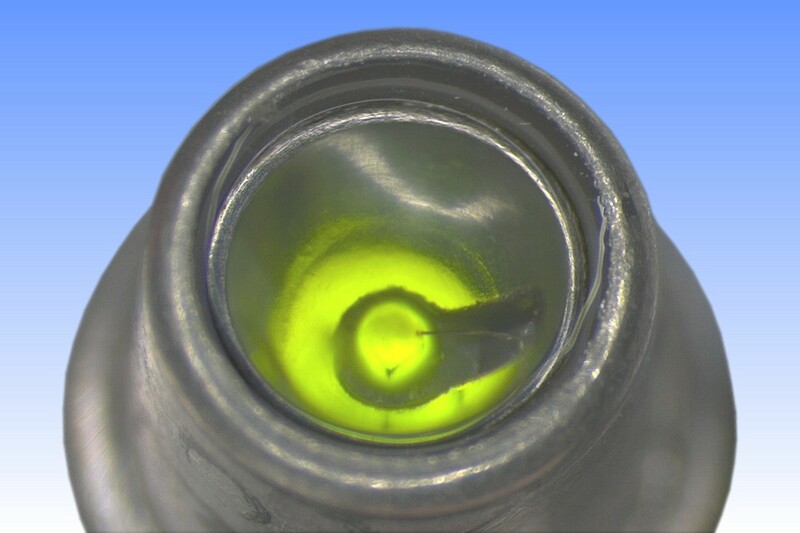 That employed a single phosphor, believed to be LaF3:Yb,Er with a broad green emission. Similar developments were made by the Scientific Research Institute of Semiconductor Devices in the former USSR, resulting in the АЛ360 device featured here. It existed in two models, the АЛ360А and the АЛ360Б, the latter featuring doubled output. This device is unusual in that shows two emission peaks, in the green and in the red. 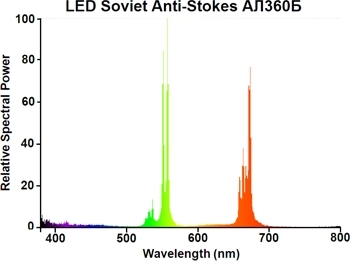 The addition of the red anti-stokes phosphor has presumably been made to increase luminous flux - these have a quantum efficiency up to 2%, ten times better than the 0.2% of typical green anti-stokes phosphors. Its impact on luminous flux is less significant however, owing to the human eye's higher sensitivity to green wavelengths. The green and red phosphors are suspected to be BaYF5 and Y3OCL7 respectively. Lamp Power: 17 mW Nominal 34 mW Max. 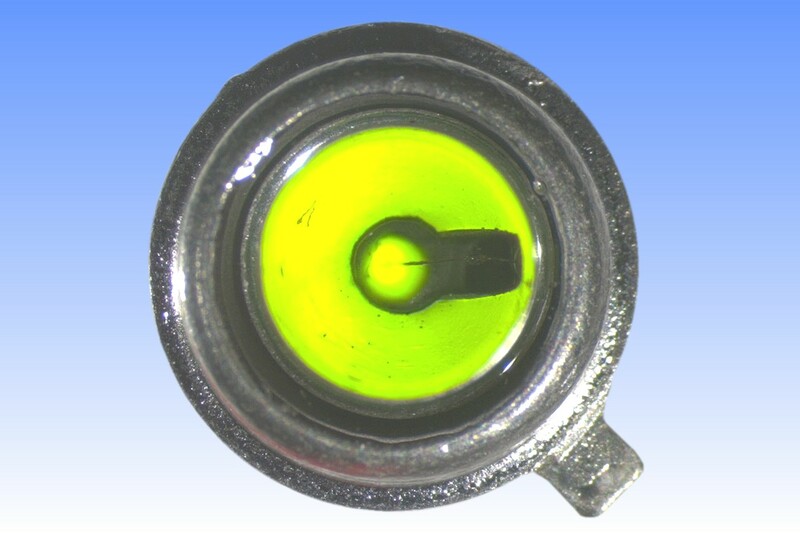 3) Lamp Phosphors, H.L. Burrus, Osram-GEC Ltd., M&B Monograph No. EE/10, ISBN 0.263.05133.1, 1972, pp.57-59. 4) Author's spectral measurements of operating device.